The mailman just delivered the August issue of UK's Bike magazine, and it's 194 pages of amazing. 37 motorcycle road tests (including current v. future iconic bikes), cornering tips from Valentino Rossi (! 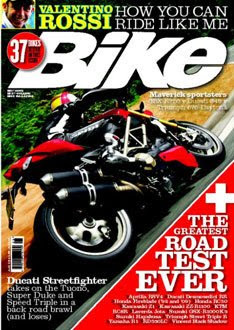 ), touring stories, a hilarious and scary time trial competition around London, and an article detailing how the top MotoGP racers are forced to use the throttle and brakes on the current crop of GP motorcycles in ways we mere humans can't even imagine, much less duplicate. All this in large format with low ad-to-content ratio, a sense of humor and fun, and distinct lack of the namby-pamby PC that pervades some mags. Why oh why can't our American advertising circulars, oops, I mean moto-mags, do this? My guess is that they have so much ad revenue they simply don't have to: evidence the give-away subscription fees. Until our Yankee mags catch on (I'm not holding my breath), I'll just have to go on sending big bucks, OK, pounds, across the pond for subscriptions to Bike and Ride.